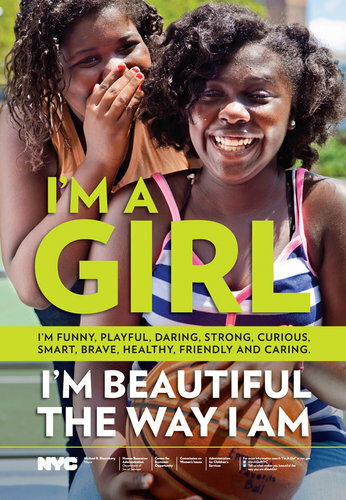 A new campaign has been launched in New York City called the New York City Girls Project. It is designed to tell girls they are beautiful the way they are. An article in the New York Times on Monday, September 30 profiled the project which was noted to be the first campaign aimed at female body image to be carried out by a major city. City officials cited evidence in The American Journal of Maternal/Child Nursing and elsewhere that more than 80 percent of 10-year-old girls are afraid of being fat, that girls’ self-esteem drops at age 12 and does not improve until 20, and that that is tied to negative body image. Margaret told me that the research they were referring to was done by Dr. Linda Andrist and published in MCN. Her study on Media Images, Body Dissatisfaction, and Disordered Eating in Adolescent Women found that more than 80% of girls over 10 were afraid of becoming fat, and that self esteem dropped at age 12. It’s so very seldom that we see information from nursing journals being in the popular press that I practically passed out when I saw this!!!! I called Dr. Andrist, and she was thrilled as well. We all should applaud this very significant recognition. Congratulations to both Dr. Freda and Dr. Andrist for this accomplishment! This entry was posted in News, Nursing and tagged news, professional colleagues, research by Leslie. Bookmark the permalink.